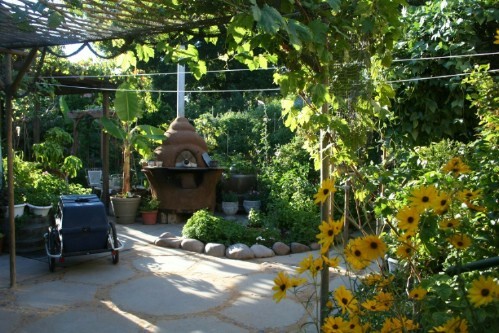 Home » Home » Sustainable Living? 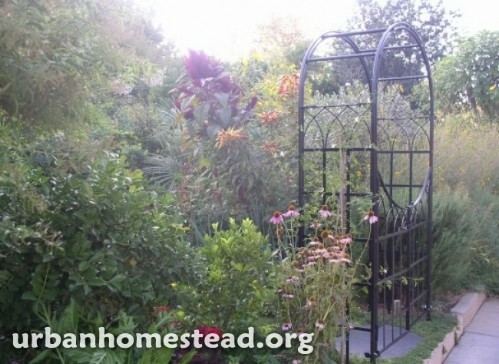 This Urban Homestead Produces 6,000lbs of Food Every Year! Sustainable Living? 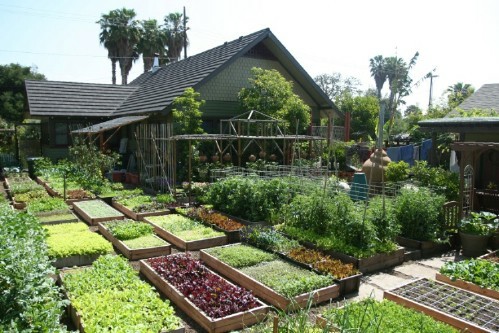 This Urban Homestead Produces 6,000lbs of Food Every Year! We all like the idea of self-sustainability, growing and cultivating our own food, although it may seem quite a daunting task when you think of everything that you need. A few herbs and vegetables in your garden is a great way to start, but the Dervaes family shows us just how far you can run with this great idea. 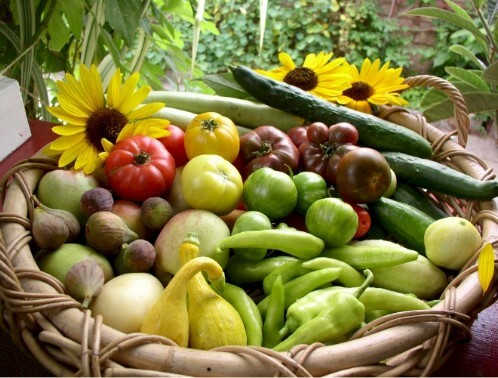 Today, the family of four produces over 6,000lbs (about 2,720kg) of organic food per year on their 1/10-acre garden. You wouldn’t believe it at first sight, but this house is located in Pasadena, California, and is home to Jules Dervaes and his three kids (Justin, Anais, Jordanne) and all their fruits, veggies and animals. Not only do they save a hell of a lot of money by growing their own food, but they even make money from it by selling the excess to restaurant chefs and caterers – about $20,000 per year to be precise. This is just some of the fresh, organic fruits and vegetables that the Urban Homestead produces and sells for a steady income. In addition to the 400 species of different vegetables, fruits, berries and herbs, the vegetarian family also rears chicken and ducks, dwarf goats and dwarf rabbits for eggs, milk and manure. Oh, and of course they have bees so they even produce their own honey. 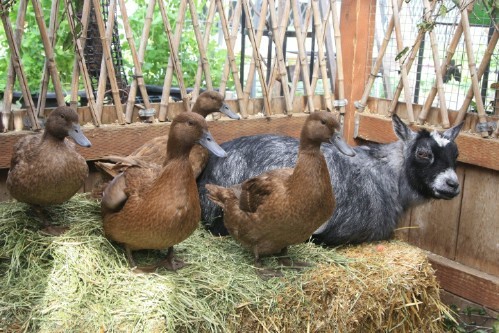 The vegetarian family rears chickens and ducks that lay literally thousands of organic eggs for them every year. The urban homestead doesn’t just stop at food, though; they do as much as they possibly can to lessen the strain on the environment through the use of solar panels. This benefits them greatly, too, since the highest electricity bill they’ve had so far was just $12 for the whole year. And forget about spending a fortune on gas, the Dervaes’ actually brew their own biodiesel from old oil that they get for free from restaurants. The processor that turns used veggie oil into biodiesel fuel that they use in their cars. In the mind-1980s, dad, Jules Dervaes, bought the house in Northwest Pasadena that was in dire need of repair. Desperate for that country living lifestyle, he decided to make do with what he had, and started off with the veggies. This, however, was not quite enough – the family wanted much more independence and a lot less impact on the environment. Apart from merely growing their own food, they also preserve and prepare cleverly: they make their own bread, cheese, butter and yogurt and they also freeze and can foods so that they last. 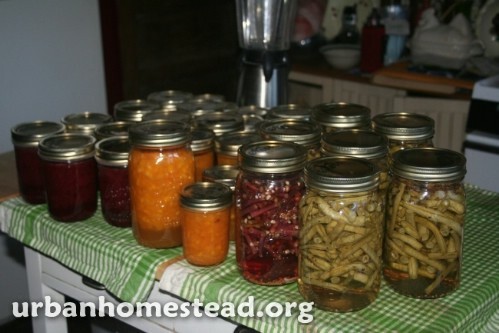 Food is safely preserved in order to allow longevity and eliminate any chance of food wastage. 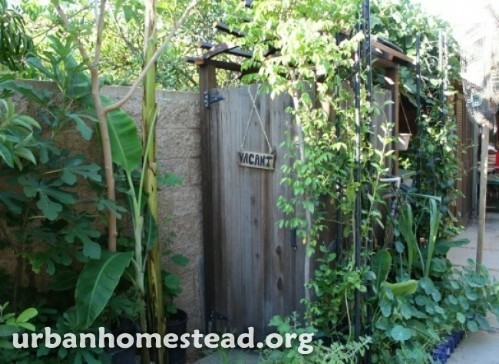 Water is conserved by limiting toilet flushes and using low-flush toilets, using a solar-powered outdoor shower, using a front-loading washer machine and reusing water, mulching to conserve moisture, and using clay pot irrigation for the plants – a system that can save over 50% of water usage. An outdoor solar shower is among one of the many ways in which the Dervaes use water and electricity sparingly. The Dervaes make sure to use energy efficient appliances, electronics and lighting (e.g. olive oil lamps and homemade beeswax candles). 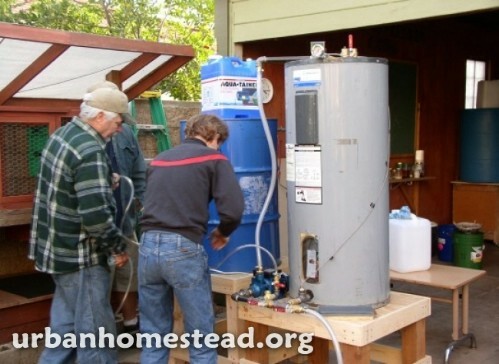 They also use non-electric appliances (mostly hand-powered) when it comes to things like a blender, toaster, solar oven, and even a pedal-powered grain mill. Transport is also a big saver since they fill their cars with their homebrewed biodiesel; apart from that though, they’ll rely on walking, cycling and public transportation. Electricity is spared with solar ovens and self-built cob ovens (like this one) that burn wood – the perfect oven to make a delicious pizza or beak some tasty bread! With this simple country-style way of life (don’t let the word ‘simple’ deceive you, though – they work damn hard! ), the family relies on home-schooling and limited TV and socializing. They are conscious of the things they consume, so they have learnt to make do with what they have (i.e. reuse and recycle), look out for second-hand items instead of new and even use bartering systems. Their soaps, deodorants, toothpastes and other cleaning products are all homemade and nontoxic. They prefer to stick with herbal medicine, cut their own hair and DIY the hell out of everything, from their solar ovens to their roofing and chicken coops. The garden isn’t comprised of just edible crops – there are also some stunning flowers that really bring the country to the city. 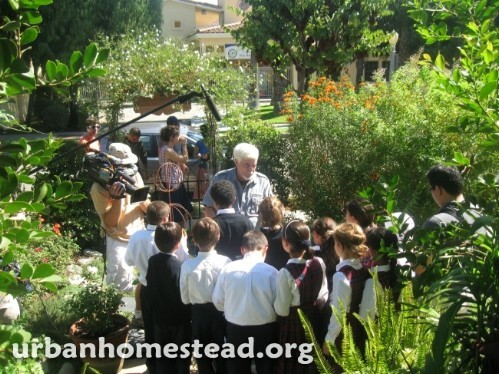 Apart from merely living this life themselves, the family behind the massively successful urban homestead do as much as possible to teach others to follow suit, or at least get a start. They’ve been recording their efforts and practices online for the past 10 years, keep an updated blog, run events and workshops to not only inspire others and build on that sense of community, but of course, also to teach the necessary skills to those who want to achieve any degree of sustainability. Jules teaching schoolchildren about sustainable living. The family feels very passionate about teaching others about their story and passing on their own knowledge and skills so that more people can live in this way. It truly is a fantastic and impressive way to live. 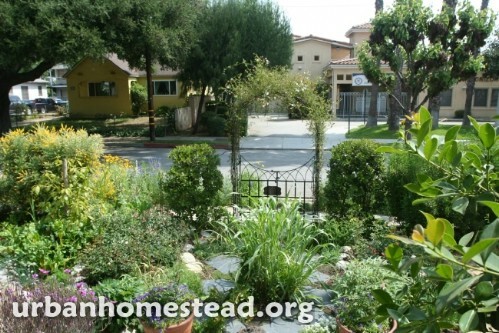 The Urban Homestead shows us that living off the land is more than just an idealized concept – it’s a very attainable way of life, even if you live in a city. You don’t have to get quite as large-scale as this, (although the point is that you actually can) but it certainly serves as a source of inspiration for those of us who want to get the ball rolling. View of the regular city street from within the magical urban homestead. Great inspirational article, but I’m not sure this would work in the northeast and northern Midwest.